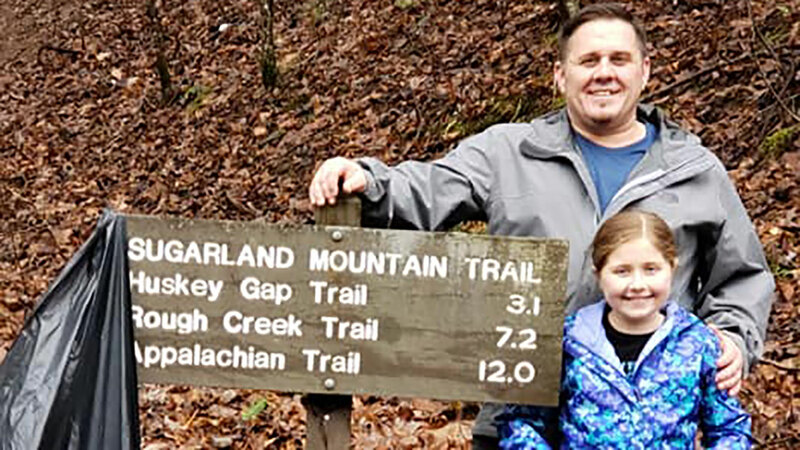 As the National Park Service copes with the government shutdown, Marc Newland and his daughter Erica set off into Great Smoky Mountains National Park to pick up litter on the trail. GATLINBURG, Tenn. -- As the partial government shutdown drags into its second week, people all over the country are pitching in to preserve public lands however they can -- including a father and daughter in Tennessee who embarked on a "litter patrol" hike to clean up a local national park. Marc Newland wrote on Facebook that, while "'real-life' responsibilities" had kept him and his 10-year-old daughter Erica from their usual weekly hikes and father-daughter quality time, his 10-year-old thought their hike on Thursday would be best spent giving back to Mother Nature. "We regularly do cleanups around our area and always bring out litter that we run across during our hikes, but Thursday we decided to focus our efforts exclusively on litter patrol," Newland explained to ABC. Trash bags and trash pickers in hand, the pair set off for their cleanup hike in the Great Smoky Mountains, a subrange of the Appalachian Mountains that straddles Tennesse and North Carolina, in Great Smoky Mountains National Park. According to the National Park Service, the 800-square-mile park is the highest-visited of all 59 national parks, beating even the Grand Canyon. "We headed up the (Laurel Falls) trail and before we knew it, our bags were full. We didn't quite make it to the waterfall before we had to turn back to make it to a doctors appointment, but we will be returning soon to pick up where we left off," Newland wrote in the Hike the Smokies Facebook group. Marc Newland and his 10-year-old daughter Erica on their "litter patrol" hike in Great Smoky Mountains National Park. Newland said the excursion was "fun and very rewarding," and Erica challenged other hikers to "take one day off from getting in miles and impressive vista pics and instead give back by grabbing a trash bag, heading to the park and collecting some litter." "These mountains give so much to so many people. Imagine if only a fraction of those people decided to give back to the mountains," he added. NPS is one of the agencies impacted by the partial federal government shutdown that began on Dec. 22. More than 16,000 of the agency's approximately 20,000 employees are furloughed, according to an estimate from the nonprofit National Parks Conservation Association. While some NPS sites remain open to the public, they are largely understaffed, leaving the agency unable to provide nonessential visitor services like trash collection, concessions and visitor center staffing and certain maintenance operations. In Great Smokies, local nonprofit Friends of the Smokies has the committed funds necessary to keep some NPS employees on the job in the park through the shutdown, according to local media reports. "We hope that everyone will be respectful of the park," Jim Hart, the organization's president, told WBIR-TV. "We would hope that everybody would leave no trace."